It sounds simple – routine monitoring of your rotating equipment results in data necessary for deriving information about the condition of your equipment. But if the data isn’t accurate, your analysis won’t be either. If you can’t acquire data in a timely manner, you’ll miss early warnings of developing problems. Emerson’s condition monitoring solutions are specific to the application and criticality of your machines, and deliver data you can count on for accurate diagnosis of machinery condition. 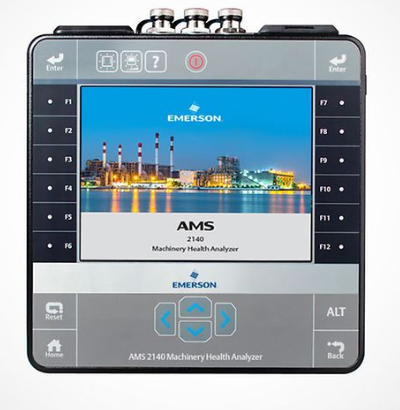 The AMS 2140 Machinery Health Analyzer takes vibration data and analysis measurements to the next level. It features simultaneous four-channel plus phase data collection and unique peak detection capabilities for the earliest indication of bearing and gearbox degradation. In addition to delivering faster data collection for less time in the field or more machines monitored, the AMS 2140 is ergonomically designed for comfortable, single hand operation all day long. Collecting Vibration readings (overall, analysis bands, waveforms, and Spectra) on routine basis using a portable analyzer / data collector is a useful tool in predicting vibration related problems in rotating production assets that are defined as important but less than critical. Critical assets are defined as those assets that would halt or reduce production if they fail or shutdown which are typically a few machines counting up to about 10% of the plant rotating assets. Important assets can be as many as 75% of the total rotating asset count in a typical plant. By performing routine prediction data collection on these assets, the user (maintenance and operations teams) are warned early enough of developing problems so that detailed analysis is performed and necessary maintenance actions can be planned and implemented within the plant maintenance management activities.